Why is AWARENESS a power? Because without awareness we don’t thing we need to change and we stay stuck in our thinking. Awareness that we are limited and don’t have the answer to all our problems is the first power. We think we should have the answers. We were given a brain to think things through. We should be able to figure this out, we say to ourselves. So, we usually experience the awareness that we don’t have the answer, as discomfort, or some form of pain, physical, mental or emotional pain. We begin to become aware that we are in pain, frustration, anger, etc. Sometimes it takes severe pain before we become aware of it, but it’s not necessary. Awareness opens us up to consider something else. Oftentimes it is out of desperation, but again we can choose to see pain as awareness, recognize it as one of our powers at any time, and utilize our power to move on to our next power. The more we develop our awareness, the less suffering we put our selves through. There are many uses for our awareness but it is the first step we need to take to experience something new. Becoming the PossiDude we are meant to be is always a new experience. How do you practice awareness? What does it look like in your life? We welcome your comments. After we develop our Vision by looking at the big picture, and learn to avoid trouble, we start to grow in Wisdom. 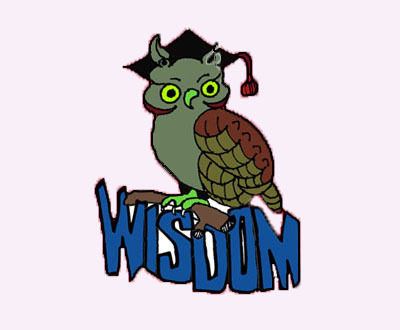 Like the Owl, we discover that no matter how much we learn there is always more to learn. The owl watches all the animals and learns from them. He learns from the ones that make good choices and the ones that make not so good choices. He doesn’t have to do what they do. He can learn from watching others, which is what makes him so Wise. So we begin to watch and learn from others and develop our super power of Wisdom. Using our Wisdom saves us from making costly mistakes. A wonderful power to have! The ability to learn by watching others is one of our greatest power. Have you learned from watching others? Did it save you from making a mistake? Doesn’t it feel good? Write in and let us know about it. 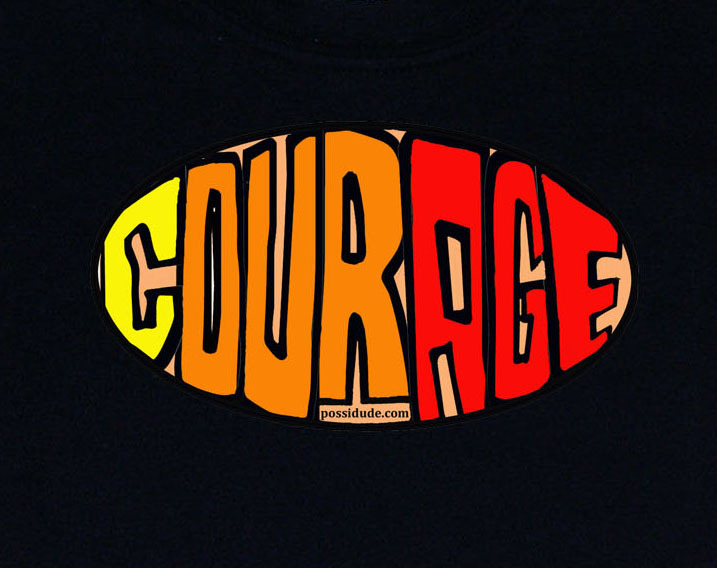 We can now begin to use our power of courage to act. We have to have our powers in order because they build on each other. To make sure we have our powers with us we can ask three questions. Do I have the ability to pause, do I have Pauseability? And did I look at the big picture to see what might happen if I take action, do I have Vision? Have I learned from watching others do similar things? If we try to act on Courage without pausing and looking at the big picture, and using our Wisdom, we could make a poor decision and hurt ourself or someone we love. But once the powers are in place, we can ask our inner hero what action we should take, and know that our choice will be a good one. Like the lion, he no longer lets fear stop him. Some people think the lion has no fear, that might not be true, he just doesn’t let his fear stop him. He knows he is strong yet he doesn’t act foolishly. He doesn’t show off his strength he just uses it to get the things he truly needs. He’s not concerned with what anyone thinks of him. In the beginning we might make some mistakes, but we will learn from them. Maybe we didn’t consider some possible outcomes, or maybe we didn’t really stop and pause, or maybe we forgot to ask PossiDude what we should do, maybe we thought it was okay if we just did what we wanted. There are no mistakes, only opportunities to learn and become the super hero that we truly are. Making mistakes and admitting to them is one of the best ways to develop our powers. The way of the super hero is not easy, but it’s worth it. Write in and let other PossiDudes know how you’re doing. We need to help each other if we are going to save this planet. Don’t be afraid to share your mistakes with us, we are all growing together. Once we learn to develop PauseAbility, before they take action, PossiDudes always use their Vision. Just like the Eagle. From his perch, the Eagle can see the big picture. He takes in everything with his sharp eyes and he doesn’t move until he has taken all things into consideration. With his vision he not only sees what he is after but he sees the things others miss, like the mountain lion ready to jump on him as he dives in to get a drink of water. He sees the bigger picture so he doesn’t make the mistakes that could get him hurt. The mistakes that others, who don’t have Vision, make. But you are smarter and have more powers than an Eagle, so just ask the PossiDude inside you some questions before you take action: What will happen if I do this? Is this cool? Can anybody get hurt? Would a good super hero do this? The real super hero in you will answer these questions. 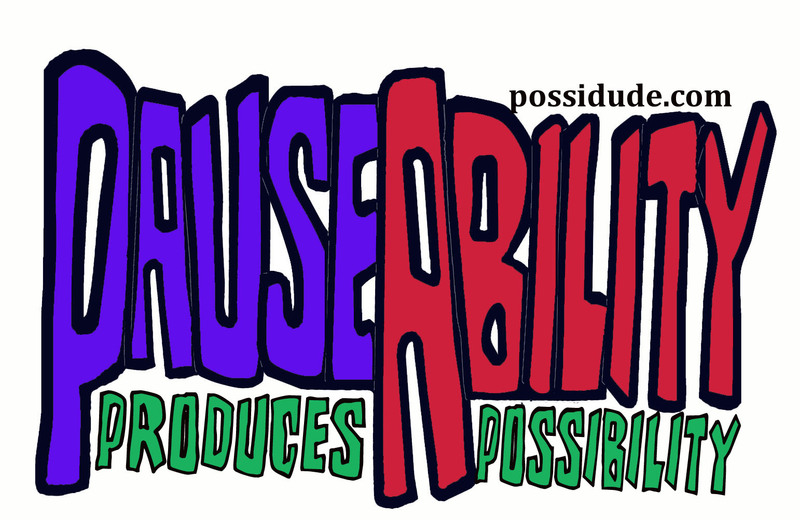 Remember PossiDude is already there inside you. Listen for the answers to the questions you ask and you will begin to hear them. Some call PossiDude the “still small voice within”. I assure you it’s there. Sometimes the answer is just a better question, like, “what’s the right thing to do here?”. The more you do this the better your Vision becomes. 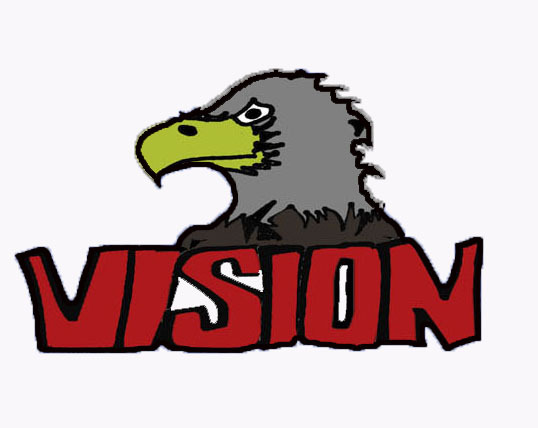 Are you practicing stopping and asking for Vision? Are you seeing things you missed before? Write in and let other PossiDudes know how you’re doing. A real super hero practices over, and over, again until he gets so good at it, it becomes who he is, a real PossiDude, a dude with a Positive Attitude, making the right choices! Once we recognize we are upset, angry, or frustrated we need to us our power to pause and be quite. Just stop. It only takes 10 seconds. Count to ten slowly and listen to the sounds around you. Try it several times. Try it as you go through your day, just listen for 10 seconds. How did you do? Can you stop just for a minute? Even if you can’t seem to stop, just ask the super hero inside you, PossiDude, to help you. If you don’t quit trying you can’t fail! You will be developing your super power of PauseAbility. PauseAbility gives you the power to choose before acting. It may seem like a little thing, but that’s what makes it so powerful! Most of the poor choices we make are because we never developed our power of PauseAbility. (remember you already have this power you just didn’t know it) Think about a poor choice that you made. Would you have made that choice if you had the ability to Pause first? So how’s it going? Can you feel it? Write back in this blog and share your experience. When were you able to use your power of PauseAbility? Write in and help other PossiDudes and read about their experiences.